The Old German Meeting House in Waldoboro, Maine is a new addition to the Sacred Spaces of New England project. Built in 1772, the Old German Meeting House was the center of the German Lutheran community, who began immigrating to Waldoboro in 1740 at the invitation of Samuel Waldo, promising a better life. If you would like to learn more about the meeting house, please visit the Old German Meeting House’s entry on the Sacred Spaces of New England website. The St. George Greek Orthodox Cathedral in Springfield, Massachusetts is a new addition to the Sacred Spaces of New England project. In 1907, the community of St. George Cathedral celebrated the formation of the church with its first Divine Liturgy. If you would like to learn more about the cathedral, please visit the St. George Cathedral’s entry on the Sacred Spaces of New England website. The MIT Chapel in Cambridge, Massachusetts is a new addition to the Sacred Spaces of New England project. Completed in 1955, the MIT Chapel is a non-denominational place of worship designed by architect Eero Saarinen. If you would like to learn more about the chapel, please visit the MIT Chapel’s entry on the Sacred Spaces of New England website. First Presbyterian Church VR is a Google Cardboard app presenting the sanctuary of the First Presbyterian Church in Stamford, Connecticut. A recording of the musical composition, “Coventry Carol” performed by the New York Symphonic Brass with James D. Wetherald on organ accompanies this 360-degree immersive experience. Founded in 1854, the First Presbyterian Church commissioned noted architect Wallace K. Harrison in 1953 to design its present structure. Harrison was both a contributing architect and coordinator of such major public buildings as the United Nations, Rockefeller Center and Lincoln Center. The structure, which was completed in 1958, is thought to be one of the finest examples of religious modern architecture along with those designed by Le Corbusier, Philip Johnson and Frank Lloyd Wright. Its reinforced concrete and stained glass walls are formed from more than 20,000 individual chunks of inch-thick glass – a stained glass technique called “dalle de verre.” The stained glass design on the right side of the church’s sanctuary suggests the story of the crucifixion and on the left, the story of the resurrection. The stained glass in the narthex or rear of the church displays symbols of communion and peace. Although not intentional, the church’s sanctuary has been likened to the form of a fish in both profile and floor plan – a symbol used in early Christianity. For those who are new to Google Cardboard, it is a virtual reality platform that uses a relatively low-cost cardboard or plastic viewer in conjunction with a mobile phone device to create an immersive experience. For more information about the Sacred Spaces of New England project, please visit: http://sacredspacesofnewengland.seththompson.info. Saint Spyridon Greek Orthodox Cathedral in Worcester, Massachusetts is a new addition to the Sacred Spaces of New England project. Established in 1914, Saint Spyridon Greek Orthodox Cathedral is a center for spiritual worship to over 6,000 people in the Worcester area. If you would like to learn more about the church, please visit the Saint Spyridon Greek Orthodox Cathedral’s entry on the Sacred Spaces of New England website. The Saylesville Meetinghouse in Lincoln, Rhode Island is a new addition to the Sacred Spaces of New England project. Built in 1704 and expanded in 1745, the Saylesville Meetinghouse has been in continuous use as a gathering place for the Quakers for over 300 years. If you would like to learn more about the meetinghouse, please visit the Saylesville Meetinghouse’s entry on the Sacred Spaces of New England website. St. Catherine Greek Orthodox Church in Braintree, Massachusetts is a new addition to the Sacred Spaces of New England project. Officially formed on October 23, 1960, St. Catherine Greek Orthodox Church grew out of a need to serve the growing Greek Orthodox population in the southern and western parts of Boston. If you would like to learn more about the church, please visit the St. Catherine Greek Orthodox Church’s entry on the Sacred Spaces of New England website. Trinity United Methodist Church in Springfield, Massachusetts is a new addition to the Sacred Spaces of New England project. With roots dating back to 1791, Trinity United Methodist Church considers itself a “Community Cathedral” dedicated to worship, learning and recreation. If you would like to learn more about the church, please visit the Trinity United Methodist Church’s entry on the Sacred Spaces of New England website. 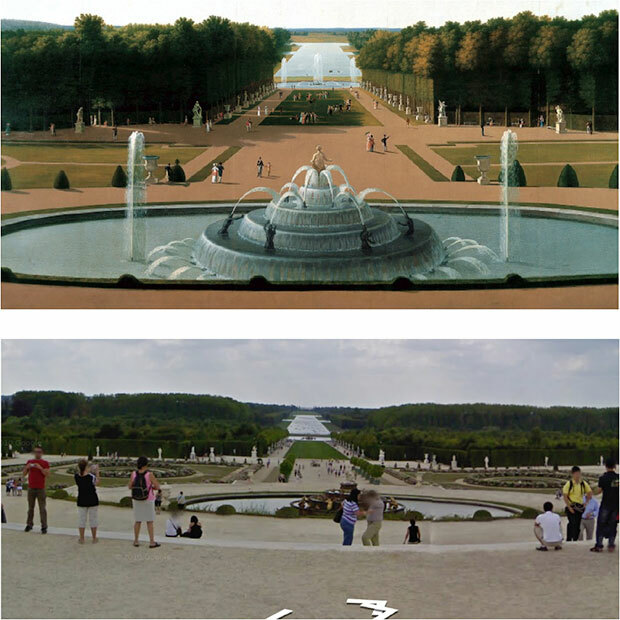 Detail of John Vanderlyn’s Panoramic View of the Palace and Gardens of Versailles, 1819 (top) and Detail of Google World Wonders Project (Palace and Park of Versailles), 2012 (bottom). Image capture: Seth Thompson. My essay entitled, “Cultural Heritage and Spectacle: Painted and Digital Panoramic Re-Presentations of Versailles” has recently been published in Streetnotes: Ethnography, Poetry and the Documentary Experience (Volume 25). By comparing and contrasting two panoramic projects of Versailles, one being a painted panorama by John Vanderlyn (1775-1852) completed in 1819 and the other, part of Google’s World Wonders Project launched in 2012, this paper will examine the notion of heritage as a tangible entity, experiential consumable, and identity maker, and show how heritage sites and the panorama (both painted and digital) act as a spectacle that seeks to fulfill the needs and desires of its visitors to consume past and present cultural landscapes. Presentations of Versailles.” Streetnotes: Ethnography, Poetry and the Documentary Experience (Volume 25): 353-365. url: http://escholarship.org/uc/item/339598d3. Published Online: November 3, 2016.